Do You Know the History of the Advent Wreath? Advent is a time of preparation and hope, a season full of rich tradition. A common tradition during this season is the Advent wreath. At your local parish, and perhaps in your own home, the wreath is a reminder of the light of Christ. Each week that the candles are lit, we are reminded that the Christmas season is approaching and we should prepare our hearts for the coming of Jesus. But do you know the history behind the Advent wreath? We can trace the origins of the Advent wreath back to pagan tradition. Pre-Christian Germanic people lit candles and placed them in wreaths during the darkest days of winter as a sign of hope for the light that would come with Spring time. Throughout history, the use of the wreath was adopted by Christians (probably during the Middle Ages) as a way to prepare for the light Christ brings during the Christmas season. The Advent wreath is wrapped in rich symbolism. The wreath itself is shaped in a circle, a reminder of the eternal existence of God. The evergreen branches that circle many wreathes remind us that we look forward to an eternal life with Christ. Holly leaves, which have a distinct pointed look, remind us of the crown of thorns from Christ’s passion. Red berries bring to mind the blood of Christ. 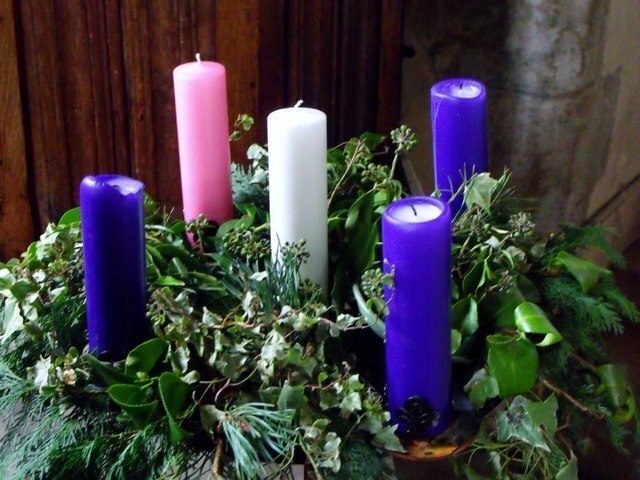 According to tradition, the Advent candles themselves also have a variety of meanings. Some traditions hold that there are four candles to represent the 4,000 years between the time of Adam and Eve and the birth of Jesus. Another tradition states that the first candle reminds us of the message of the patriarchs, the second calls to mind the prophets, the third symbolizes the call of John the Baptist, and the fourth represents Mary’s role in Salvation history. The colors also hold special meaning. 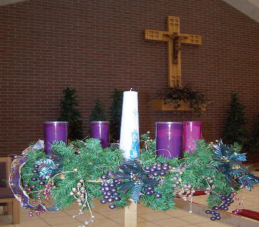 The purple colored candles remind us that Advent is a time of sacrifice and preparation. The pink candle is lit on the third week in Advent to remind us of the joy Christ brings when He returns. Did you know that each candle has a special meaning, too? Each week, the different Advent candles bring to mind certain virtues that can aid us in our journey to the manger. Here are the four meanings behind each candle in the wreath! On the first Sunday of Advent, a purple candle is lit. This candle is known as the prophet’s candle, and it symbolizes the hope of Christ’s coming. During this season of Advent, we’ll hear from the prophets, especially Isaiah, who foretold the coming of the Savior. Another purple candle is lit on the second Sunday of Advent. This candle is known as the Bethlehem candle, and it symbolizes faith. The second week of Advent calls to mind Mary and Joseph’s long journey to Bethlehem and their faith in God’s plan for salvation. The third week of Advent brings with it the lighting of the pink candle. This candle is known as the shepherd’s candle, and it reminds us of the joy the shepherds experienced when they heard of the coming of the Christ Child. Finally, another purple candle is lit on the fourth Sunday of Advent. This final candle known as the “Angel’s Candle,” a reminder of the message of peace that the angels brought with them as they sang of the birth of Christ. Whether you watch the priest light the candles in your parish over the next weeks, or light the candles of your own wreath in your home (the domestic church! ), the wreath and candles are a beautiful reminder of the season.